Last week, we saw triple-digit temperatures. 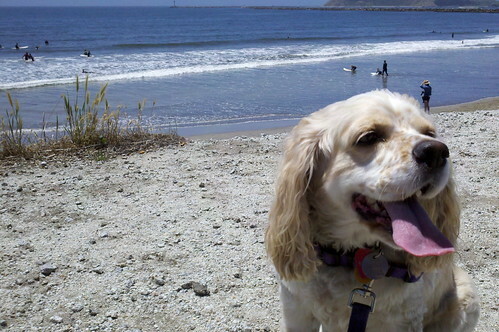 In order to cool off, I took Daisy to the beaches at Half Moon Bay. This is the first time she has ever been on a beach and she looked so mellow. I asked her if this is better than her life in Kansas. We walked next to the waves. She sniffed the salty water. 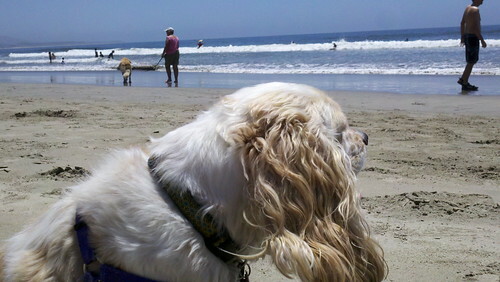 She headed for dry land when the waves lapped closer to her paws. 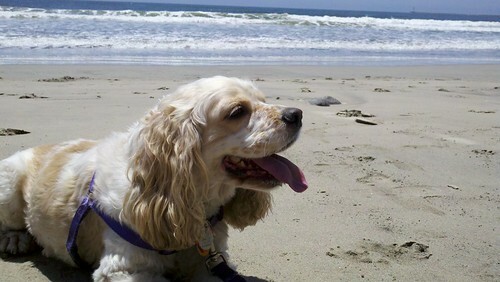 Daisy looked happy on the beach and I can’t wait to go back with her. Over the weekend, I met Wookie at Polished Lounge. He was with his human, one of our anchor/reporters at my station. 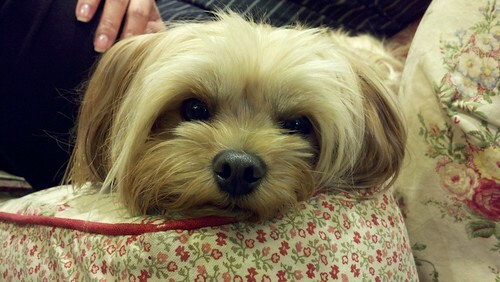 Wookie watched his human and her co-workers have their hands and feet pampered as part of a “ladies day.” I sipped sparkling wine and nibbled on red vines as a salon worker buffed my feet and massaged my legs with hot lotion. It was fun and relaxing. I swapped puppy stories with my co-workers. At work, I met the Klepto Cat. Awesome! This is Dusty from San Mateo. His neighbors check with Dusty’s humans first if they’re missing jewelry, bikinis, towels and more. Animal Planet and Dave Letterman have featured the cat burglar on their shows.